A kind friend coming back from the Netherlands has got me a couple of packets of stroopwaffels, and I've just realised again how totally delicious they are. Its that combination of crisp and sticky, sweet, but not deadeningly so and that amazing back of the throat richness. Stroopwaffels are diabolically deceptive - the richness doesn't hit you all at once, so you think you can eat more, and before you realise it you've finished the pack and are feeling distinctly queasy. I admit there may be other things AS addictive, but I doubt there are many that are MORE. What I'd like to know is how hard are they to make at home? I remember seeing a vendor in an Amsterdam market making them in his stall, but otherwise I've only ever seen the finished packed product. Does it need a special grill? They have waffle indentations, but are much thinner and also seem crisper - more fat, I guess, which is why they can keep, while waffles can't. What about the syrup that's used to sandwich the layers? Just plain golden syrup or something else? Would it be possible to substitute honey, since golden syrup isn't that easy to come by where I am (Bombay, I think we make sugar in a different way in India, so you get jaggery, not syrup)? And a major question: why do all the stroopwaffels I've eaten taste of coconut? Not right through, just that first bite and a really strong smell/taste? Do they grease the griddle in coconut oil and if so, why? those are those thin round ones with chewy sweet paste in the centre, right? Especially addictive when you put them on top of your mug of hot tea so the syrup just starts to go gooey. Stroopwaffels, mmmm! I lived in Holland briefly, and fell head-over-heels in love with stroopwafels. Returning to the states was nightmarish enough without having to endure the pain of stroopwafel-withdrawal. 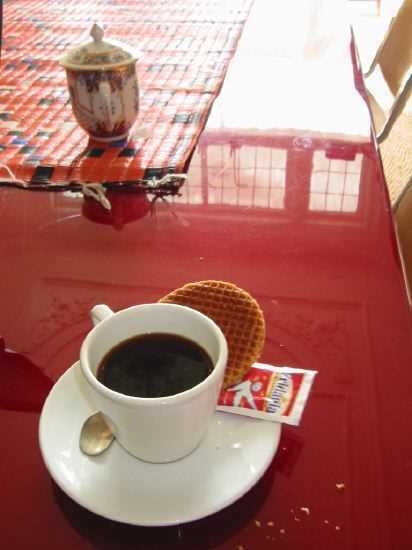 I know that there is a special iron used to form them, and also that the crap they serve locally in coffee houses in no way tastes like a real stroopwafel. ok, this sounds really yummy, but I'm not sure I get what it is exactly. I lived in The Hague for two years, and also became addicted. thanks for the photos. that looks like what I was thinking. I've really got to get out of Detroit more, don't I? I had these for the first time on a recent trip to the Hague and Amsterdam and was really charmed by them. Really nice with coffee or tea. It is important though to make sure you purchase those made with real butter. I was excited to see some over here (in a museum shop after a Dutch painting exhibit) and it was disappointing compared to what I remembered. Trader Joes has actually started carrying them also. They are imported from The Netherlands but are made with margarine. You may want to try them for a taste, but they are much better with butter. Seems like something one could order though to get a taste. I'm going to Amsterdam soon. Can anyone recommend a specific place or two (in Amsterdam) where we can get good stroopwaffels? Especially addictive when you put them on top of your mug of hot tea so the syrup just starts to go gooey. I was about to say the same thing -- this is how my own Dutch friends taught me to eat them. Failing a cup of tea, a blast in the microwave for 10 seconds is a good substitute. Oh my God, these are some of the most wonderful things on earth!!! A friend's husband brought them back from a business trip to Amsterdam and she gave me a box. I cried as I ate the last one thinking I would never find them again, but lo and behold an International supermarket in Tokyo has a nice supply on their shelves and they make their way into my cart everytime. I have routed trips through Amsterdam just to buy them by the case at the duty free. If I ever suceed I will report here! Nice to see so many other stroopwafel fans! And thanks for reminding me about this trick. It was the perfect solution to a wet day in Amsterdam, with the cold wind blowing down the canals. One suitably spiked coffee, one stroopwafel - and maybe that cake-like apple pie they make to follow - BLISS! You get them everywhere, they're not a particularly fancy item and they keep well so you can buy them in any grocery. If you want them really fresh then I think the place I saw them being made on the street was the Albert Cuyp market, which is quite a nice place to wander around. Amsterdam is a pretty good place for sweet baked stuff. Apart from that apple-pie I mentioned (anyone got a recipe?) you should go to the banketbakkerijs or biscuit shops where you get a whole range of great little cookies and pastries. I've just remembered I particularly liked one type which was called a wellington, but I've quite forgotten what it was like. Interesting to read about the stroopwafel origins as a product made with the remains of the other products. There must be quite a few other such products. Weren't petit fours invented to make use of the heat in the ovens after the main baking was done? somebody just HAD to bring these up didn't they?! ...You get them everywhere, they're not a particularly fancy item and they keep well so you can buy them in any grocery. If you want them really fresh then I think the place I saw them being made on the street was the Albert Cuyp market, which is quite a nice place to wander around. Stroopwaffels are especially good if you set them over the mouth of your teacup. The steam rises and softens the cookie and melts the caramel a bit. I first had these 6 years ago and was hoping to make a vending stand at flea markets and fairs like when I saw them outside amsterdam. The recipe on the thread given from strropwaffle.com isn't really a good one as all the ones I had all where a yeast based dough and it is the quality of the cinnamon used to attract everyone to the smell and the taste. Also the caramel syrup is usually made with a dark corn syrup base. I have the recipes somewhere that I had translated from dutch. I'll post it when I get to it. While we are on this topic has anyone ever got to try a true belgium waffle? Similar yeast dough with large sugar granules throughout the dough to give you that nice caramel crunchy center after it is baked! So I've just returned from Amsterdam. After reading all these posts raving about stroopwafels, I couldn't wait to taste a hot, fresh one. I found the man who makes fresh stroopwafels at Albert Cuyp market. He handed it to me on a piece of parchment. It was about six inches in diameter, filled with dripping caramel syrup. I bit into it, the syrup burning hot. It was hot, gooey, sticky, crispy, and very sweet. I couldn't manage more than two bites of it! Way too sweet and cloying for me. My 17 year old daughter tried it, and she wouldn't even take a second bite. I guess it only proves the adage, chacun a son gout. Wow, that's a giant-sized stroopwaffel! The ones I ate were much smaller- perhaps 4 inches, or less. Even if you didn't like it, I hope you were able to enjoy the beautiful city. Someone mentioned further back that you should go for the *real butter* versions of these; I agree. They're more than 2 times the price, but they are so much better than the margarine/shortening versions. In dutch, the text usually says something like "met boter" on the real ones. I don't think the fresh ones you get at the street stands are really the same thing as the ones you get with coffee. I'd compare the difference to store-bought and vs. homemade chocolate-chip cookies... they're named the same, but nobody expects them to compare (in either direction!). The ones they sell/give in London starbucks are a pale imitation of the Dutch version, in my snobby opinion. If you aren't in an area with a supermarket, every dutch candy store I've been in sells these... and since the dutch are so sweets-obsessed, you should have no trouble finding a store. Has anyone tried these and ones from Amsterdam? If so, are they pretty authentic? These are definitely better than the ones from PCC. skyflyer, THANK YOU!!! I used to live in the Netherlands, and have tried every 'stroopwaffel' I've run into here, in hopes of the real deal. Until now, it's been a no-go. These seem to be the real deal. My package came last night, and in my excitement, I tried one right out of the box. Just a little crust around the edge. Sweet and perfect in the middle. While they weren't as good as the ones I used to get from the bakery by my house, these are the closest I have ever tasted to that esteemed sweet memory. I had my second one a few minutes ago, warmed up over a cup of coffee. I think this is as good as it gets in the States. What an excellent find!!! !